But actually, neat and sturdy stitches aren’t limited to Baskets for Guys. 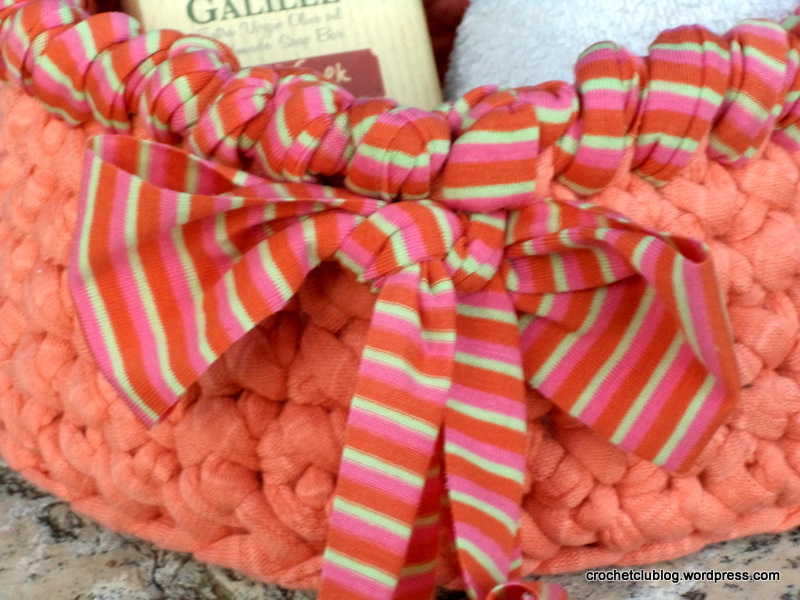 I had fun making these for the lovely young ladies, splurging in peachy orange, sparkly purple and pink-striped trim. I’m sounding bold but all along there was that nagging hesitation too – will the baskets fit the color scheme of their destined surroundings? Will they suit the receivers’ individual tastes, which I so admire and respect? But if we went along with thoughts like that, there’d be no give and take, would there, to use Eeyore’s terms. And thinking of that, weren’t Pooh and Piglet a little hesitant about their own gifts too, and wasn’t Eeyore so very pleased to get them nonetheless? And does a flower ask itself every day if its colors are just right, and if its petals are facing the exact right direction? So, I guess all we can do is pick up our magic wand and crochet that pumpkin – or lilac – and send them on their way! The baskets are posing here with a little something in them, and in real life, there were other little somethings inside. No problem with ribbons this time! Using a size 12 hook and fabric yarn, I made a round spiral base in SC. I worked the sides in yarn under single crochet, working into the back loops only of the base. I made the trim in crab stitch, or reverse single crochet. I left a tail at the beginning and end of the trim, and used it to tie the bow. That’s it! This entry was posted in Projects and tagged basket, bowl, crab stitch, crochet, DIY, fabric yarn, t-shirt yarn, tarn, textile yarn, trapillo, yarn under single crochet on May 5, 2015 by The Basket Fairy.